Here is a thread where I thought we could post pictures and information about The King, Queens and Prince Carl Philip's attendance at the Olympic Games in Athens from August 20-30. First, The King, Queen and Prince Carl Philip watched the swimming competitions and Stefan Nystrand's 4th place swimm in 50 m freestyle. And then, they went to the arena where the table tennis is played - and watched the almost heroic (in the eyes of Sweden) game of J-O Waldner against World Champion Timo Boll - which he won! It was great fun to see the table tennis game, there were almost a thousand Swedes there and The King and Queen were showed on the screen every now and then. 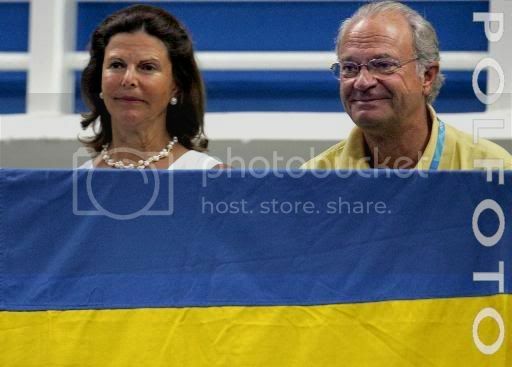 The Queen held a Swedish flag that she waved, and The King clapped his hands. The Swedish supporters dominated the entire arena, and carried Waldner to victory. After the game, the arena played Abba's "Dancing Queen" and the Swedish fans went nuts! :) Waldner drank some water, talked to the coach - and then he walked over to The King and Queen and Prince Carl Philip to greet them. The King did the manly congratulations thing and pounded him on the back, while The Queen gave him a hug! - I've been following him a bit and have understood that he hasn't been in the best shape. But now he is fantastic. - An old fox like him, we can still count on! I watched the game to, it was SO great! Great messages and pictures from the games in Athen! By Brainpix I have seen pictures from the queen and the king by swim event. 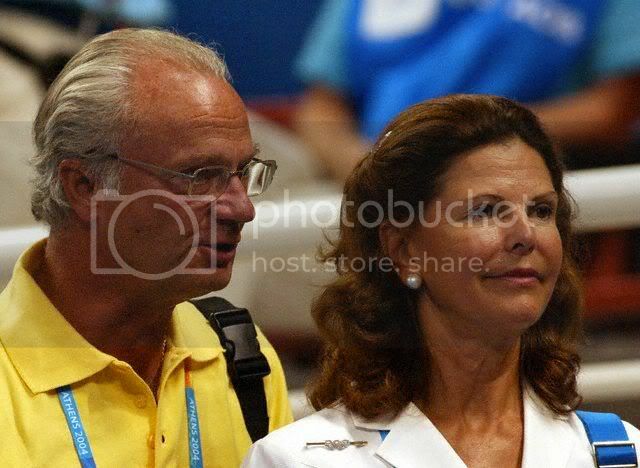 Have Carl Gustav,Silvia and Carl Philip arrived in Greece for Olympics? Yes, they arrived on Friday. I so want to see them to...I've been trying to get in to brainpix for some time now but it's impossible unless you work with pics and so on...really would love to see the pics! Nice pics of Silvia and Carl Gustav. Thanks for the photos. I wonder why more members of the family didn't come and how long they will stay. Didn't Silvia and Carl Gustav meet during the Olympic Games? Well I think that three (The King, Queen and Prince Carl Philip) members representing the Royal Family is quite okay - even though I wouldn't mind if the others would be there too... :) Right now I don't think Princess Madeleine has the time to attend the Olympics, even if she wanted too, cause the term at university starts now - and she's a full-time student... They will stay until the end of the games. Yes - The King and Queen met during the Olympic Games in Munich in 1972, and this is also one of the reasons that the Olympics still today holds an extra special place in their hearts. How about Victoria?I think that she usually attends events with The King and The Queen than Carl Philips.Why doesn't she attend? This morning when they showed the Waldner match live, they showed Carl Gustav and Silvia a few times on TV. Are the blue suits the King and Queen are wearing in some of these pictures the same as the ones worn by the Swedith athletes when they entered the stadium the night of the opening ceremonies? 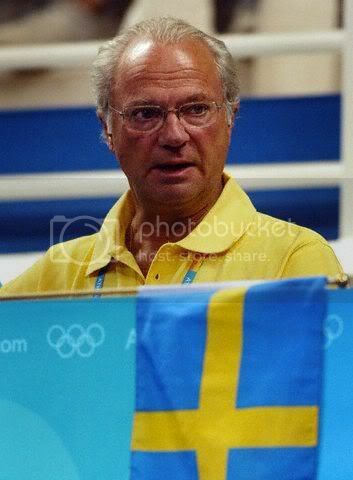 I have noticed that many of the royals in attendance at the Athens games are sporting the same clothes as the athletes, such as Haakon in the beige suit at the opening ceremony the same as the Norwegian athletes, Frederik and Mary in the red and beige shirts of the Danish athletes, and the Spanish royals in red, golden and white attire. A wonderful show of support by all the royals for their respective athletes. so what is the casual look of the Swedish team look like??? Thanks Grand Duchess and all, i would of had dark blue compared to the light blue..
Oh,so lovely.They wore the same colour T-shirt.